Simons Electric - servicing and installing home and business phone systems and VoIP in Waukesha, Brookfield, and Milwaukee. Imagine your home or business with a single telephone system that can manage a complete range of converged voice and data requirements over a single network, while offering the feature-rich phone solution that meets the needs of your busy Franklin home or New Berlin office. Now you can enhance your home or business communications with the right system, the first time. Utilize the Auto Attendant for professional greetings and after hour answering/courtesy services. Conduct three way conference calls. Set up reminders on the phone to alert you of important appointments. Always know who is calling with Caller ID that shows name and number. Capture important information during calls by using the Record-A-Call feature. Provide employees and/or strategic retail areas with their own line and voice mailbox. Use the speakerphone for hands-free calls. Avoid unwanted calls through Do-Not-Disturb feature. Always know when you have a message waiting with the message indicator light and remote message notification. Automatically route calls to specific phones with the Caller ID detection feature. 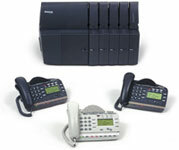 Complement the system with devices such as fax machines and/or credit card machine. Provide everyone in your house with their very own voice mail. Use the intercom or paging features to reach other family members throughout the house. Set separate ring tones for business or family extensions within your home. Utilize the remote notification feature to be notified to new voice mail messages. Record calls using the Record-A-Call feature to capture important information. Use the auto attendant for professional greetings and call processing. Use the speakerphone on system phones for hands free calls. Add wireless phones to extend your access to the yard or pool. Set up restrictions to control when your children can use the phone and who they are permitted to call. Set the call forwarding to cell phones so you don't miss the call you've been waiting for. © 2009 Simons Electrical Systems. All Rights Reserved. Website by Mike Schneider Designs.